Cutting-edge technologies provide apt objects for nostalgia. Their time is brief, their promise of a dust-free, odor-free, worry-free future so quickly fades that one hardly has time to notice, or to resent, the hyperbole. The Polaroid process was once a marvel—it still is, really: pictures in a instant, film that develops itself, yielding, in just seconds not days, the image of your loved ones or of the natural wonders you think you’d like to be reminded of someday. But sometimes you pulled the layers apart too soon. Or you kept the film too long. The chemicals did their work, regardless. 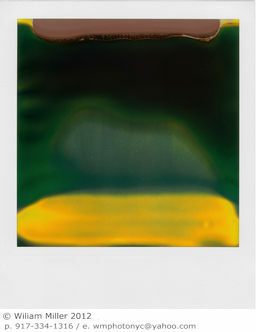 William Miller (via La Boîte verte) has collected “Ruined Polaroids” with striking results. Some, like this one, look like Abstract Expressionist paintings, others like the remains of mysterious disasters or the surfaces of faroff moons. Miller has also published striking photographs of the polluted waters of the Gowanus Canal. See his weblog for more. You can still buy a Polaroid Instant Camera. “Instant is back!” says the company’s website.